We'd like to give a big thank you to the landlord for giving us permission to use his car park. This is a trial, and only affects those rides that start in Great Shelford. Our Haslingfield and Brookside starts are unchanged. Please assemble in the car park, not in front of the pub. Cars may be parked here but please park at the far end, away from the pub. We have now published our programme of rides for April. Now that the clocks have changed (on 29th March) we switch to our summer timetable. From April our rides on Sunday rides start at 9am and 2pm and our Wednesday evening rides become weekly. 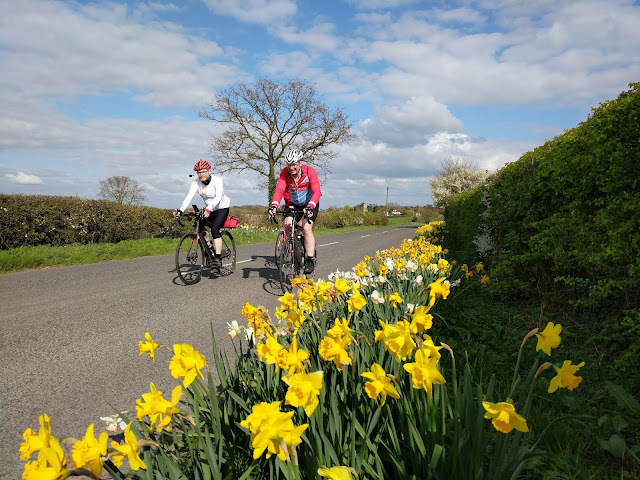 Our Sunday and Thursday rides get a bit longer, with some of the Sunday 9am rides becoming "full-day rides" with three food stops, including meeting the 2pm afternoon ride for tea. Photo from our ride on Sunday 2nd April 2017. 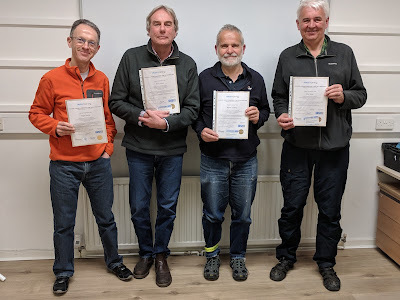 Nigel, Peter, Rupert and John proudly display the first aid certificates they received following the completion of a training course in February. Ten of our members took this course which involved a full day of training with a qualified trainer. CTC Cambridge supported 50% of the cost. We were lucky enough to secure the services of Susan Clements, a vastly experienced trainer who provides much of the first aid training given to "Bikeability" instructors in Cambridgeshire. The course covered all the mandatory components of the "Emergency First Aid at Work (Level 3)" syllabus, including practising cardiopulmonary resuscitation (CPR) on dummies and the use of a defibrillator, as well as some cycling-specific scenarios. Peter Wilson, Welfare Officer. The Len Nice Memorial Trophy is awarded each year for exceptional service to the club, following a vote by members. This year it was awarded to Angela Taylor (on the left in the photo). 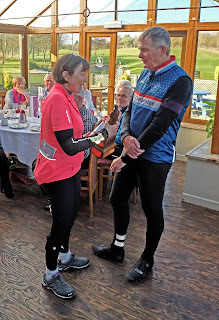 The trophy was presented to Angela by our chair, Andy Carlyle, at the club's "Winter Banquet" on 24th February 2019. More information about the Len Nice Memorial Trophy may be found here. Thursday 25th Apr: Thursday ride - city start (moderate, 65-75 miles) Meet at 9.15am at Brookside. Coffee is at Gamlingay, LJ's Sandwich Bar. Lunch is at Henlow, The Five Bells. Leader: Peter Wilson (07760 324125). Thursday 25th Apr: Thursday ride - village start (moderate, 65-75 miles) Meet at 9.30am at Haslingfield Green. Coffee is at Gamlingay, LJ's Sandwich Bar. Lunch is at Henlow, The Five Bells. Leader: Sharon Jackson (07969 412967). Sunday 28th Apr: Sunday light day ride (moderate, 60-70 miles) Meet at 9.00am at Brookside. Coffee is at Saffron Walden, The Curious Goat. Lunch is at Clare, Platform One Cafe. Late change of coffee stop. Leader: Sheila George (07807 827490). 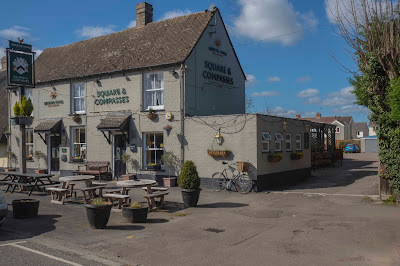 Sunday 28th Apr: Sunday afternoon ride (moderate, 35-45 miles) Meet at 2.00pm at Brookside. Tea is at 4.00pm at Wimpole Hall, The Old Rectory Restaurant. Leader: Greg Tucker (07774 281591). For rides after 1 May see our rides list.